Who ever said British and American reviewers were the only ones to omit the names of translators in their reviews of foreign works? 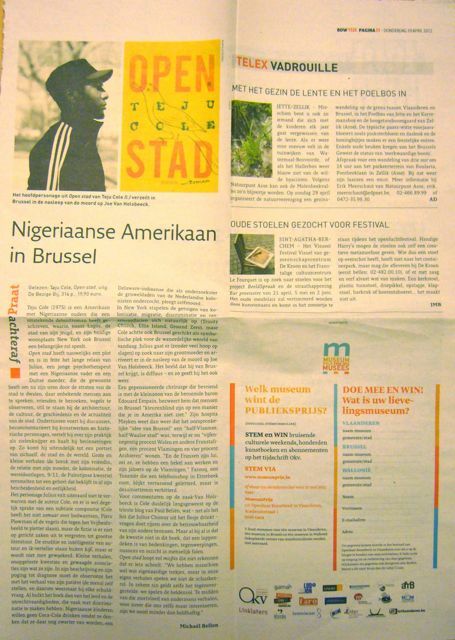 This recent review by Michaël Bellon in the Dutch-language Brussels weekly Brussel Deze Week of Open stad, the Dutch translation of the young American writer Teju Cole’s novel Open City, makes no mention of the translator’s name. But perhaps the reviewer was simply distracted by the fact that the novel, about a young Nigerian-German psychiatrist in New York a few years after 9/11, is in part set in Brussels, where the protagonist arrives shortly after the murder of a young man for his iPod. Novels partly set in Brussels are indeed relatively rare in fiction, let alone contemporary American fiction. Be that as it may, I found the translator’s name on the publisher’s website: it’s Paul Van Der Lecq.